New Braunfels Lodging – Welcome to New Braunfels, Winter Texans! A lot of thoughtful preparation goes into planning a winter-long getaway to Texas Hill Country. Luckily for prospective visitors, there’s a seemingly endless array of New Braunfels lodging along the breathtaking banks of the Comal River. River City Resorts has dozens of affordable New Braunfels vacation rentals that are minutes from the area’s best attractions. The Gruene Historic District is home to an eclectic mix of shopping, dining, wine tasting, and good old-fashioned honky-tonks. 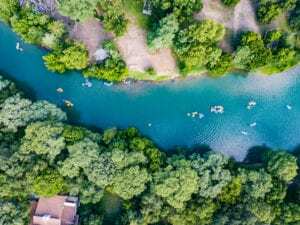 The Comal River, the world’s smallest river, is a popular year-round hub for tubing, swimming, snorkeling, and picnics. Stars & Stripes Drive-In Theatre, Guadalupe Brewing Company, and Winery on the Gruene are three popular evening stops for adults. New Braunfels has arguably the best collection of restaurants in Texas Hill Country. With a wide variety of cuisines to choose from, you’ll always leave our local restaurants satisfied and smiling. Alpine Haus serves authentic Bavarian-style cuisine in a rustic 164-year-old building. Couples often visit Huisache Grill and Wine Bar for an intimate and casual dining experience complete with contemporary recipes and fresh seafood. 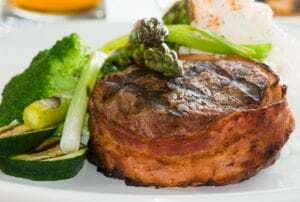 We also recommend Gruene River Grill’s fish tacos, Gristmill’s bacon-wrapped eight-ounce filet mignon, and McAdoo’s mahi-mahi New Orleans signature dish. After each full day of outdoor adventure, fine cuisine, and live entertainment, retreat to your New Braunfels lodging for riverfront fishing, a late night swim, and a shared bottle of local wine. We’re one of the only New Braunfels resorts to provide riverfront condos, villas, and homes. Visit RiverCityResorts.com or dial 1-830-626-2196 to get matched up with an affordable, sizable, and charming vacation rental!